Whereas many in the mainstream media were clearly hoping that Mr Bolsonaro’s left-wing rival, the Workers Party (PT) candidate Mr Haddad would make up some ground in the weeks between the first and the second round, it is, in fact, the rightwing evangelical who is easily amassing on his earlier lead. Mr Bolsonaro, despised in the leftwing press for past quotes that now prove to be controversial, proved no problem for Brazilian voters who nearly gave him half of the vote tally on the 7 October first round with a total of some 46% (a feat no one before him had ever pulled off ever since Brazil votes in two rounds for President). Furthermore, if the latest figures are to be believed, he will win by landslide on 28 October. Related coverage: <a href="https://thegoldwater.com/news/39073-Bolsonaro-Prosperity-Freedom-Family-and-God-Or-The-Path-Of-Venezuela"> Bolsonaro: “Prosperity, Freedom, Family and God” Or “The Path Of Venezuela”</a>. The latest Ibope poll surveyed 2,506 people between October 13th and 14th had a possible margin of error was plus or minus 2 percentage points. It was commissioned by local media organizations Estado and TV Globo. The results were quite disheartening for the PT candidate, Mr Jair Bolsonaro now stands 18 percentage-points clear of his rival. Bolsonaro won 59 percent of valid vote intentions versus 41 percent for the Workers’ Party candidate, Fernando Haddad. The survey also showed Haddad’s rejection rating now stands at 47 percent, compared with 35 percent for Bolsonaro. A Datafolha poll out last Wednesday showed the ex-Army captain had a 16-point lead over the former mayor of Sao Paulo. In other words, with less than two weeks to go until the runoff vote October 28th, Mr Bolsonaro is in a commanding position. Related coverage: <a href="https://thegoldwater.com/news/39150-Brazil-Election-They-Want-To-Transform-Our-Flag-Into-A-Red-Flag-The-Flag-Of-Communism"> Brazil Election - “They Want To Transform Our Flag Into A Red Flag, The Flag Of Communism!”</a>. The candidates will have equal TV and radio airtime to make their case before the final vote, but it is as yet unclear whether they will actually face each other in a live debate. Mr Bolsonaro claims to still suffer from the stabbing attack during a campaign rally on September 6th and given the wide lead he now has in the polls, there is no actual reason for him to agree to a debate. 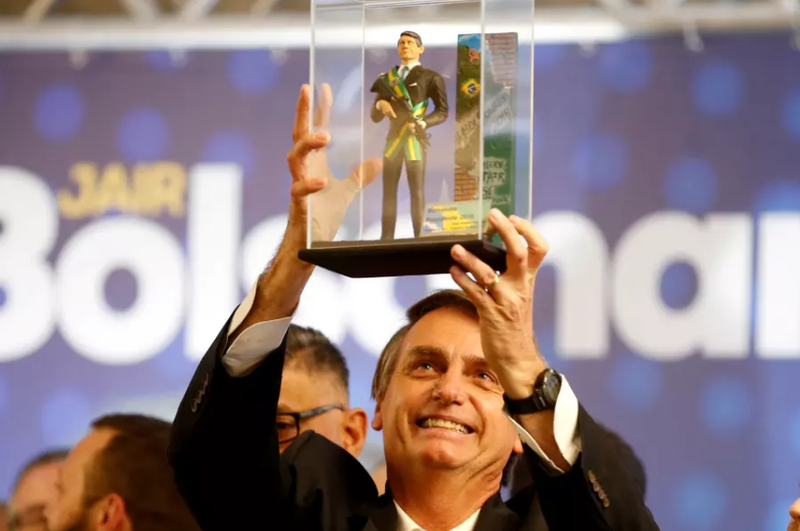 Stock markets are optimistic about the result as Mr Bolsonaro is widely considered the most market-friendly of the two contenders. GOGO BOLSONARO!! GOD BLESS BRAZIL AND LET FREEDOM RING WORLDWIDE! !